In the Eighteenth and Nineteenth Centuries. Grand duchy of central Europe, its capital bearing the same name. 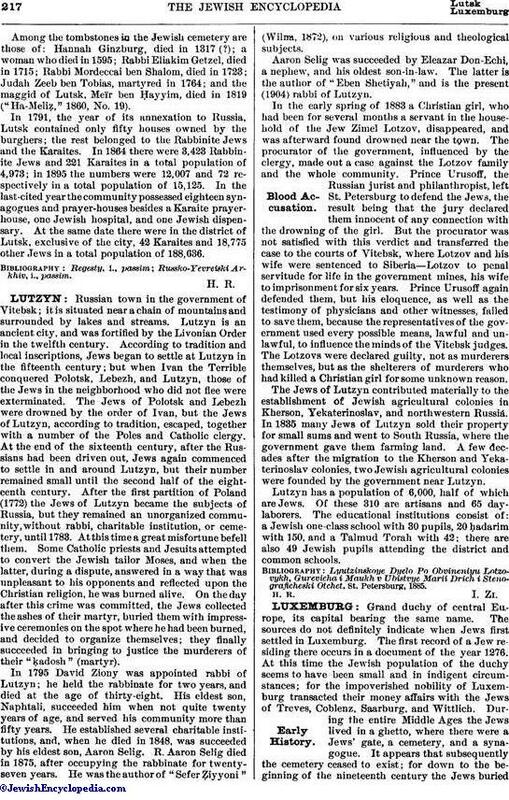 The sources do not definitely indicate when Jews first settled in Luxemburg. The first record of a Jew residing there occurs in a document of the year 1276. At this time the Jewish population of the duchy seems to have been small and in indigent circumstances; for the impoverished nobility of Luxemburg transacted their money affairs with the Jews of Treves, Coblenz, Saarburg, and Wittlich. During the entire Middle Ages the Jews lived in a ghetto, where there were a Jews' gate, a cemetery, and a synagogue. It appears that subsequently the cemetery ceased to exist; for down to the beginning of the nineteenth century the Jews buriedtheir dead at Freudenburg, in the district of Saarburg, province of the Rhine. As elsewhere in the German empire, the Jews of Luxemburg were the "servi cameræ" of the German emperors, and as a source of income to the imperial exchequer they were placed by the emperors under the protection of the local princes. Thus, on May 7, 1350, at the time of the Black Death, Charles IV. ordered the governor and the provost of Luxemburg to look to the safety of the Jews living there. In 1370, when the Jews of Brussels were accused of having desecrated a holy wafer, Wenzel, Duke of Brabant and Luxemburg, expelled all the Jews from Brabant; and none are met with in the country during the next fifty or sixty years. With the beginning of the Burgundian rule (1441) Jews are again found at Luxemburg; each of them had to pay two gulden for a protection that was merely nominal. In March, 1470, notwithstanding the presence of the governor and the militia, the townspeople attacked the Jews, plundered and demolished their houses, and maltreated them, so that they were barely able to flee to the castle on the Bockfelsen (Clausener Berg), to which they were admitted by the governor and whence they subsequently reached places of safety. In the beginning of the sixteenth century there were Jews at Echternach, Luxemburg, Arlon, and Igel. But no Jews are mentioned after 1527, and probably none were living at Luxemburg from the time of the Spanish rule, 1555, to the end of the eighteenth century, although Maranos seem to have lived there in the seventeenth century. All the more worthy of note is it that, as is shown by a tablet in the wall of the present fortress of the city, the famous citadel of Luxemburg was built by a Jewish engineer, Isaac de Traybac, in 1644. Little is known of the Maranos' occupations. They were probably engaged in retail business; for by a decree of the provincial council, dated April 15, 1513, they were forbidden to sell cloth otherwise than by the piece. They were never required to wear the so-called Jews' hat or yellow badge; and although they were compelled to take an oath "more Judaico" they were not required to submit to the humiliating ceremonies that usually accompanied it. A decree of Philip V., issued Sept. 6, 1703, determined the poll-tax that traveling Jews had to pay at the bridges of various cities, this decree being confirmed Sept. 20, 1720. These conditions seem to have obtained during the entire eighteenth century down to the beginning of the French Revolution; for as late as 1787 a Jew complained of this unjust tax, without receiving satisfaction. By the laws of Jan. 28 and July 20, 1790, and Sept. 27 and Nov. 13, 1791, the Jews were granted equal civic rights with the other citizens. The community, numbering seventy-five persons, was organized by a law of March 17, 1808, and was placed under the jurisdiction of the consistory of Treves. When, on the termination of the French rule, Luxemburg was incorporated with the Netherlands (1815), the community was joined to the synagogue of Maestricht; and when Holland was separated from Belgium by the Belgian revolution of 1830 the grand duchy of Luxemburg became autonomous, and the Jewish community independent. A rabbinate, subventioned by the state, was organized, the first incumbent being Dr. Samuel Hirsch (1843-66), former rabbi of Dessau. As an advocate of religious reform he had to contend with many difficulties. He was succeeded by the French rabbi Sopher, of Dijon (1866-1870). In 1871 Dr. Isaac Blumenstein was elected rabbi, and upon his death (Aug. 3, 1903) Dr. Samuel Fuchs was called to the rabbinate. A new cemetery was laid out in 1884, and a handsome new synagogue was built in 1894. On Jan. 12, 1899, the supreme court declared the community, as represented by its president, to possess the rights of a corporation. There are also Jewish communities at Ettelbrück, Grevenmacher, Esch, and Medernach; and Jews are living in about twenty other smaller localities. The communities of Ettelbrück and Grevenmacher have each their own cemetery; at Esek a new synagogue was built in 1899. The grand duchy has about 1,200 Jews in a total population of 236,543, and the capital 407, in 20,938. Only the community in the city of Luxemburg is officially recognized. It is under city and state supervision, and enjoys all the privileges accorded other ecclesiastical bodies. The affairs of the community are directed by a board of seven members, whose election is subject to confirmation by the government. Although legally the Jews of Luxemburg have full civic rights, they hold no government offices and are not represented in municipal councils. One exception, however, is to be recorded, due principally to local circumstances. In Hamm, near Luxemburg, the office of mayor is held by a Jew, Jules Godchaux, his predecessors having been his father, Samson, and the latter's cousin, Paul Godchaux. 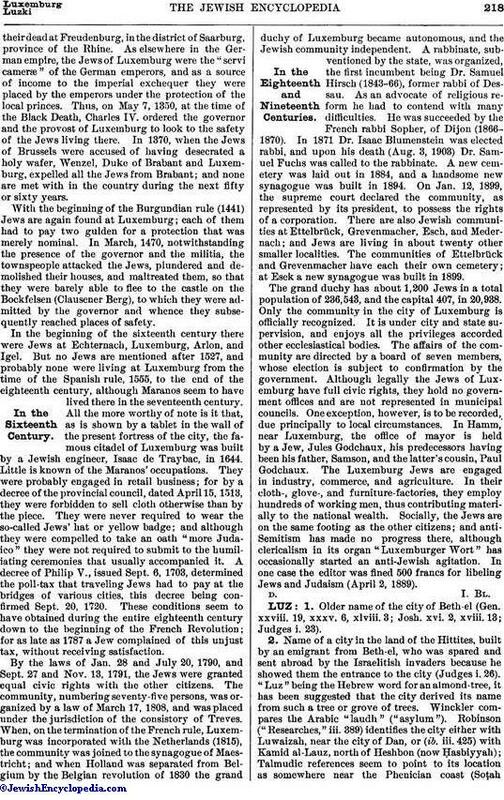 The Luxemburg Jews are engaged in industry, commerce, and agriculture. In their cloth-, glove-, and furniture-factories, they employ hundreds of working men, thus contributing materially to the national wealth. Socially, the Jews are on the same footing as the other citizens; and anti-Semitism has made no progress there, although clericalism in its organ "Luxemburger Wort" has occasionally started an anti-Jewish agitation. In one case the editor was fined 500 francs for libeling Jews and Judaism (April 2, 1889).